Definition (MSHCZE) Onemocnění zapříčiněné u lidí čtyřmi druhy prvoka rodu PLASMODIUM: PLASMODIUM FALCIPARUM; PLASMODIUM VIVAX; PLASMODIUM OVALE a PLASMODIUM MALARIAE. Je šířené kousnutím nakaženého samičího komára rodu ANOPHELES. Malárie se vyskytuje v částech Asie, Afriky, střední a jižní Ameriky, Oceánie a v některých částech karibských ostrovů. Charakterizuje ji značné vyčerpání spojené s návaly vysoké horečky, pocení, třesavkou, a chudokrevností. Malárie u zvířat je způsobena jinými druhy plasmódií. Definition (NCI) A protozoan infection caused by the genus Plasmodium. There are four species of Plasmodium that can infect humans: Plasmodium falciparum, vivax, ovale, and malariae. It is transmitted to humans by infected mosquitoes. Signs and symptoms include paroxysmal high fever, sweating, chills, and anemia. Definition (CSP) protozoan disease caused in humans by four species of the genus Plasmodium (P. falciparum, P. vivax, P. ovale, and P. malariae) and transmitted by the bite of an infected female mosquito of the genus Anopheles; malaria is endemic in parts of Asia, Africa, Central and South America, Oceania, and certain Caribbean islands; characterized by extreme exhaustion associated with paroxysms of high fever, sweating, shaking chills, and anemia; malaria in animals is caused by other species of plasmodia. Definition (MSH) A protozoan disease caused in humans by four species of the PLASMODIUM genus: PLASMODIUM FALCIPARUM; PLASMODIUM VIVAX; PLASMODIUM OVALE; and PLASMODIUM MALARIAE; and transmitted by the bite of an infected female mosquito of the genus ANOPHELES. Malaria is endemic in parts of Asia, Africa, Central and South America, Oceania, and certain Caribbean islands. It is characterized by extreme exhaustion associated with paroxysms of high FEVER; SWEATING; shaking CHILLS; and ANEMIA. 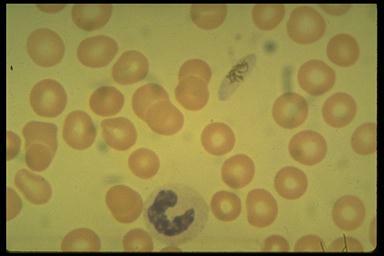 Malaria in ANIMALS is caused by other species of plasmodia. Definition (MSH) Malaria caused by PLASMODIUM FALCIPARUM. This is the severest form of malaria and is associated with the highest levels of parasites in the blood. This disease is characterized by irregularly recurring febrile paroxysms that in extreme cases occur with acute cerebral, renal, or gastrointestinal manifestations. Definition (MSH) Malaria caused by PLASMODIUM VIVAX. This form of malaria is less severe than MALARIA, FALCIPARUM, but there is a higher probability for relapses to occur. Febrile paroxysms often occur every other day. Definition (MSH) A species of protozoa that is the causal agent of falciparum malaria (MALARIA, FALCIPARUM). It is most prevalent in the tropics and subtropics. Definition (CSP) species of protozoa that is the causal agent of falciparum malaria; it is most prevalent in the tropics and subtropics. Definition (MSH) A protozoan parasite that occurs primarily in subtropical and temperate areas. It is the causal agent of quartan malaria. As the parasite grows it exhibits little ameboid activity. Definition (MSH) A protozoan parasite that causes vivax malaria (MALARIA, VIVAX). This species is found almost everywhere malaria is endemic and is the only one that has a range extending into the temperate regions. Definition (MSH) A species of protozoan parasite causing MALARIA. It is the rarest of the four species of PLASMODIUM infecting humans, but is common in West African countries and neighboring areas.